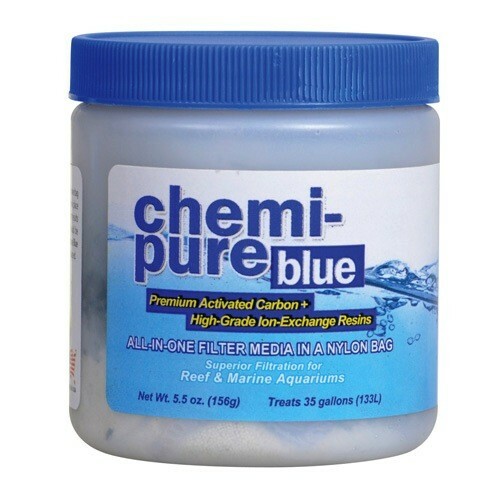 Aquaria (P) BE CHEMI PURE BLUE 5.5OZ - Rick's Pet Stores Inc.
Chemi-Pure Blue is the ultimate all-in-one filtration media for marine and reef aquariums. It offers superior filtration and remarkable results in even the most advanced aquarium systems. 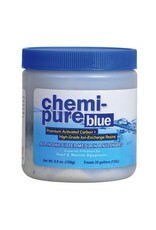 Chemi-Pure Blue combines the highest grade of low dust, pelletized activated carbon with premium ion exchange resins to produce a synergistic formula for the health and well-being of your aquarium inhabitants. This proprietary formula significantly reduces organic compounds, odors, phenols, toxins, medications, dissolved metals, phosphates, and silicates. Its high-capacity activated carbon features a very low ash content and rinses clear quickly, thereby reducing the potential of HLLE within your aquarium.